Jeremy Steward trained in Cornwall and then in Cardiff before being invited to join Wobage in 1995. Since then he has made wheel-thrown, wood-fired salt-glazed stoneware and porcelain. “Alongside a driving motivation to make functional pots, I am inspired by the soft fluidity of the materials themselves; clay on the wheel, slip and raw-glaze. My work is decorated in various ways; I often draw, a sort of wet scragfitto, while the pot is still on the wheel, or after the pot has been slipped. Otherwise they might be embellished with stamps, roulettes or finger-wipes, a vocabulary of abstract marks which are forever changing, but which consistently provide movement and fluidity in their accentuation or distortion of form. “Jeremy is a potter content to take his time to develop skills and experience but adamant that these will arrive due to ways of working suited to him. These include: making clay bodies, slips and glazes of his own composition; throwing on a momentum wheel, raw firing with wood & salt/soda. The work emerging from these conditions is therefore undergoing a constant honing for form, colour and function. What I most admire is the ‘bone and muscle’ of the throwing. But equally I like the fact that there is a quite distinct ‘track of events’ evident in his work. I have called it the fourth dimension – time. I can see and feel the time and rhythm of these pots from clay, through forming and firing, to the finished work ready for use in domestic surroundings.” Mick Casson. 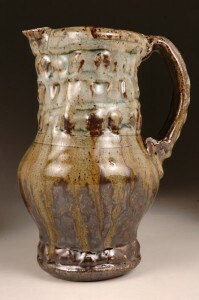 Jeremy is a Fellow of the Craft Potters Association of Great Britain. For more details and images, here’s a link to Jeremy’s own website.